Browsing the web anonymously has become a hard to do thing. Using private browsing in browsers helps to do this but still the ISP,hackers and access the data transferred while browsing. Virtual Protocol Network (VPN) creates a virtual IP address for your PC and encrypt the data you send and receive, thereby making your browsing more secure. Unfortunately many of the VPN's available today come with a hefty price tag.There are some free ones but the best seems to be Hotspot shield free. 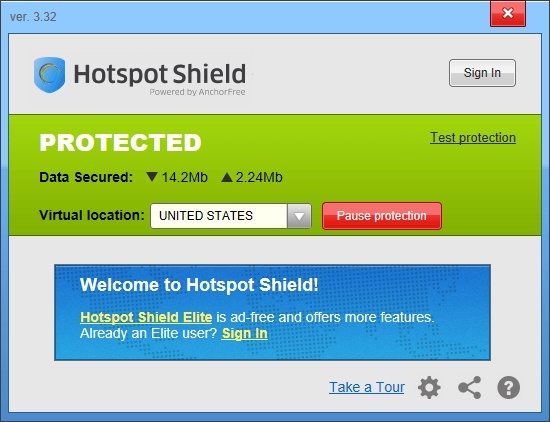 Hotspot shield free has all the features that a paid VPN has. It blocks tracking by changing the IP address and also encrypts all the data transferred. But it does come with banner ads which shows up in every website,after all it's a free VPN. I have found it really useful and it does not slowdown the internet. If you buy the elite version then you will get a ad free experience as well as the option to change your virtual IP address location, the free version is locked to use the United States IP address. This tool will be very useful in public WiFi as it will protect your data against all the prying eyes. You can download Hotspot shield free in your Windows,iOS,Mac OSX and android devices without paying a penny !